Objectives: This study compared characteristics of chronic obstructive pulmonary disease (COPD) among patients with and without alpha-1 antitrypsin deficiency (A1AD). Methods: Data from WebMD’s Lung Disease Health Check was analyzed for participants who self-reported a COPD diagnosis (N=177,865) and whether or not they had an A1AD diagnosis (based on a positive response to the question “Do you have alpha-1 antitrypsin deficiency?”). We used regression modeling to determine the relation between A1AD status and demographic characteristics, symptoms, lung function, quality of life, comorbidities, and smoking habits. Results: Out of 177,865 participants who reported a COPD diagnosis, 1,619 (0.92%) also reported an A1AD diagnosis. When compared to the total COPD population, those with A1AD were less likely to be female (odds ratio [OR]=0.68, 95% confidence interval [CI] 0.61, 0.75) or current smokers (OR 0.72, 95% CI 0.62, 0.83), and more likely to know their lung function value (OR=3.44, 95% CI 3.07, 3.87). 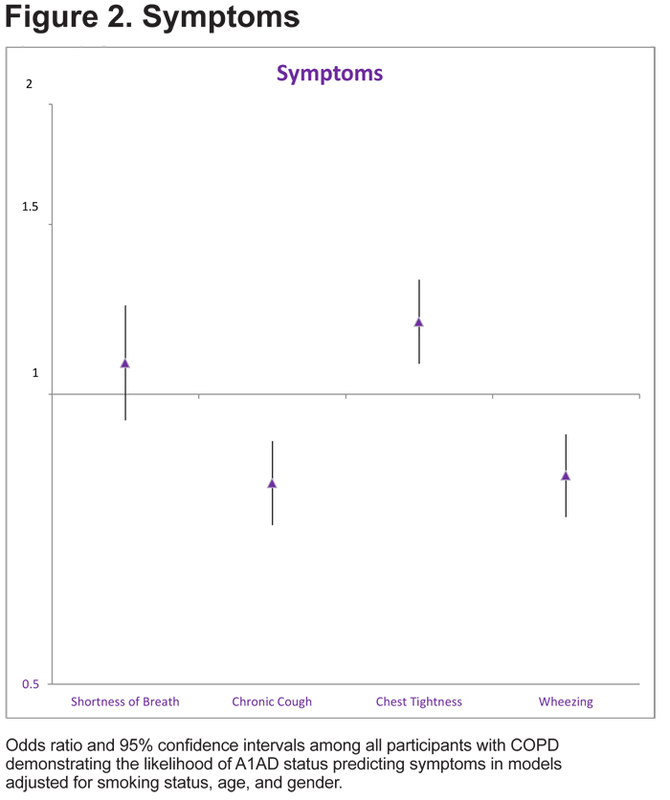 With regard to symptoms, those with A1AD were less likely to report wheezing (OR=0.82, 95% CI 0.75, 0.91) and chronic cough (OR=0.81, 95% CI 0.73, 0.89) and more likely to report tightness in the chest (OR= 1.19, 95% CI 1.08, 1.32). Overall, A1AD participants had a lower quality of life with a higher proportion reporting severe impairment in work life (OR=1.55, 95% CI 1.39, 1.7), home life (OR=1.40, 95% CI 1.26, 1.56), and personal relationships (OR=1.48, 95% CI 1.32, 1.65). Conclusions: COPD patients with A1AD report significantly worse quality of life relative to the non-A1AD COPD population. Citation: McGrady T, Mannino DM, Malanga E, et al. Characteristics of chronic obstructive pulmonary disease (COPD) patients reporting alpha-1 antitrypsin deficiency in the WebMD lung health check database. Analyzing some of the differences between COPD patients with and without A1AD may be important to better understanding the A1AD population. These differences can potentially be used to better target detection and treatment efforts. This analysis uses a very large contemporary dataset to examine how COPD patients reporting A1AD differ with regard to demographic characteristics, symptoms, lung function, quality of life, comorbidities, and smoking habits from COPD patients not reporting A1AD (i.e., A1AD-replete COPD patients). This cross-sectional study uses data from the Lung Disease Health Check from 2009-2012. All participants reporting a COPD diagnosis were included in this study with the exception of those with missing values for age or gender (N=177,820); more than 400,000 respondents of the survey did not report a COPD diagnosis and were excluded. To be included in the study, respondents had to be at least 18 years of age. Participants reporting a COPD diagnosis were then divided into 2 groups, those reporting A1AD (N=1,619) and those not reporting A1AD (N=176,191). Smoking status was divided into 3 categories: never smokers, former smokers, and current smokers. Participants were asked about pulmonary symptoms, which included shortness of breath, chronic cough, tightness in the chest, and wheezing. Comorbidities included heartburn, sinus infections, joint pain and swelling, diabetes, heart disease, hypertension, depression, and osteoporosis. Lung comorbidities included asthma, bronchiolitis obliterans, pulmonary fibrosis, sarcoidosis, and pulmonary hypertension. Participants were asked about a variety of factors that they believed may have contributed to their lung disease; of those, smoking and genetic factors were considered in this study. Participants were asked about the number of times they felt they were short of breath in the previous 2 weeks and how many times they had been admitted to a hospital with lung-related health issues. They were also asked how many days of work or school they had been absent in the past year due to their lungs. Participants were asked to rank quality of life impairment in 3 areas: work life, home life, and personal relationships. Quality of life impairment was ranked in categories of no impairment, mild impairment, moderate impairment, and severe impairment. This study also included how participants felt emotionally about their lung health issues. Participants could report their feelings as they became fearful when symptoms occurred, worried about how long they had left to live, angry for putting their loved ones through the situation, grieving for the person they used to be, and/or they had accepted their condition and were trying to take good care of themselves. All variables in this study were categorical. All statistical analyses were performed using SAS version 9.3 (SAS Institute Inc. Cary, NC). All variables in both the A1AD and non-A1AD groups were analyzed by the frequency procedure and chi-square test. In all frequency procedures and chi-square tests, the number included was 177,820 with the exception of the forced expiratory in 1 second (FEV1) score variable which was created from those who knew their FEV1 score. Both univariate and multivariate regressions were performed on each dependent variable. All multivariate regression models were adjusted for age, gender, and smoking status, with the exception of the model analyzing if patients believed that smoking contributed to their disease, which was adjusted for gender and age only. Of respondents who reported a COPD diagnosis, 0.92% (1,619/177,865) also reported having A1AD. 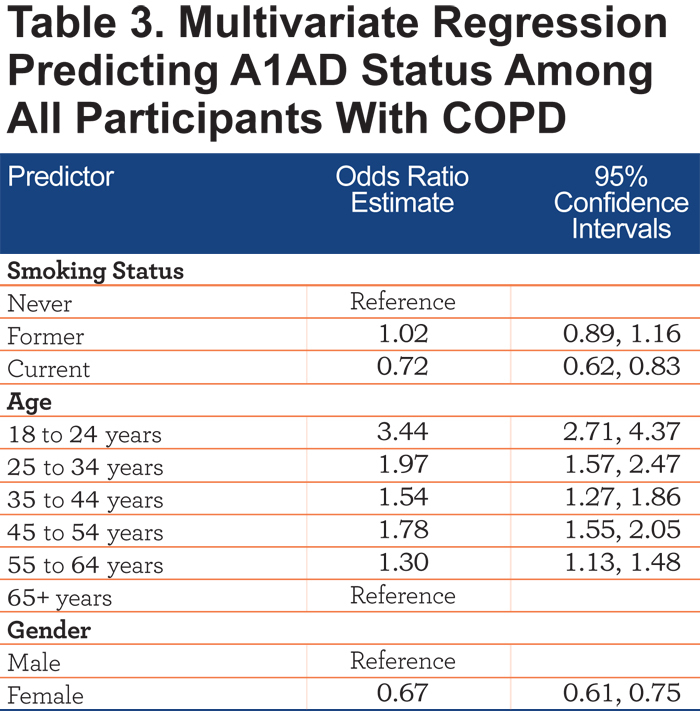 Respondents who had A1AD were less likely to be current smokers than respondents who had non-A1AD COPD, although most measures of severity were worse in those with A1AD. Frequencies and p-values can be found in Tables 1 and 2. Table 3 shows a multivariate logistic regression model predicting A1AD status. Alpha-1 antitrypsin deficiency patients were less likely to be current smokers (odds ratio [OR] 0.72, 95% confidence interval [CI] 0.62, 0.83). COPD patients with A1AD were also more likely to be younger than non-A1AD COPD patients (OR 3.44, 95% CI 2.71, 4.37 for 18-24 year olds, OR 1.97, 95% CI 1.57, 2.47 for 25-34 year olds). COPD patients with A1AD were also less likely to be female (OR=0.68, 95% CI 0.61, 0.75) than non-A1AD COPD patients. Respondents with A1AD were more likely to know their FEV1 values (OR=3.44, 95% CI 3.07, 3.87, Table 4), and more likely to report an FEV1 value of less than 50% predicted (OR=1.42, 95% CI 1.12, 1.82, Table 4 and Figure 1). COPD patients with A1AD were more likely to report chest tightness (OR=1.19, 95% CI 1.08, 1.32), but less likely to report chronic cough (OR=0.81, 95% CI 0.73, 0.89) or wheezing (OR=0.82 95% CI 0.75, 0.91, Figure 2). The relationship between A1AD and comorbidities is depicted in Figure 3. Comorbidities significantly more common in A1AD included osteoporosis, severe asthma, bronchiolitis obliterans, pulmonary fibrosis, sarcoidosis, and pulmonary hypertension. The comorbidities less likely in A1AD included sinus infection, hypertension, and mild to moderate asthma. COPD patients with A1AD were more likely to believe that genetics (OR=4.39, 95% CI 4.20, 5.15) had contributed to their disease and less likely to believe that smoking (OR=0.83, 95% CI 0.79, 0.96) had contributed to their disease. They also were more likely to report a hospital admission due to their lung condition (OR=1.64, 95% CI 1.48, 1.82). The effect of A1AD status on quality of life is depicted in Figure 4. 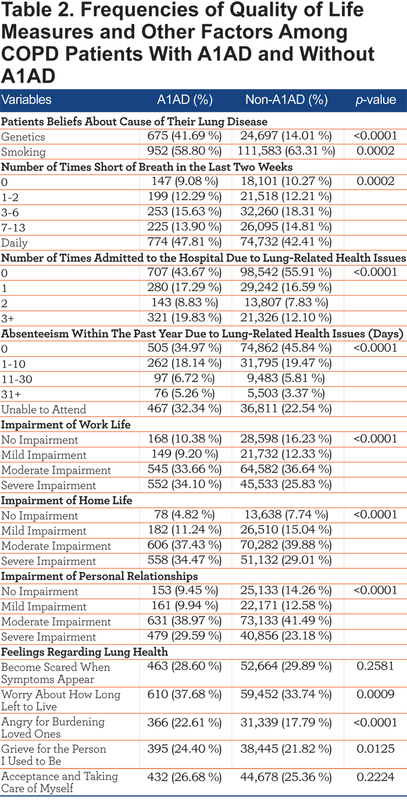 Relative to COPD patients without A1AD, those with A1AD reported more severe impairment of work life, home life, and personal relationships, in addition to more daily shortness of breath and the inability to work. Also, A1AD patients were more likely to be concerned about how long they will live (OR=1.25, 95% CI 1.13, 1.39), be angry for burdening their loved ones with their illness (OR=1.40, 95% CI 1.25, 1.58), and be grieving for the person they used to be (OR=1.26, 95% CI 1.12, 1.41, Table 5). This study used a novel database to compare a sample of the U.S. COPD population reporting A1AD, the major known genetic cause of COPD, to COPD patients not reporting A1AD. Slightly fewer than 1% of the COPD population reported A1AD, which is similar to other estimates of the proportion of COPD patients who have A1AD. 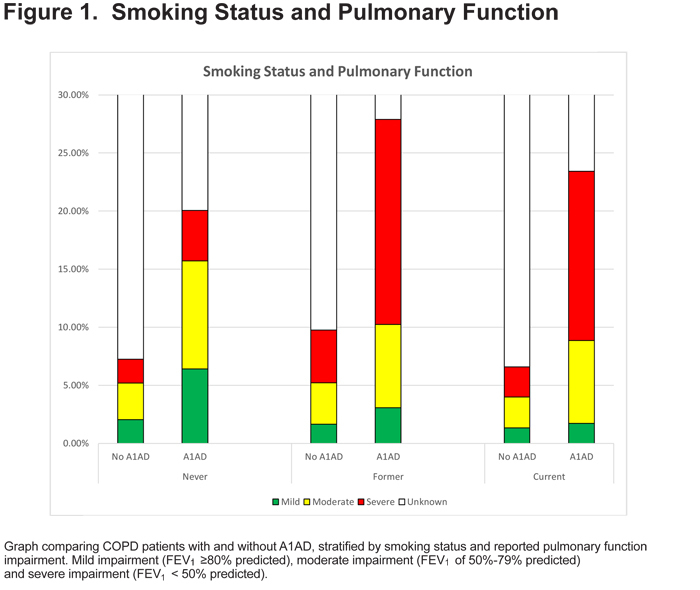 1,2 We found that COPD patients with A1AD are different from patients with non-A1AD-related COPD in demographic features, smoking habits, symptoms, comorbidities, and quality of life measures. With regard to demographics, A1AD patients were more likely to be men than non- A1AD patients (45.3% versus 37.3%). 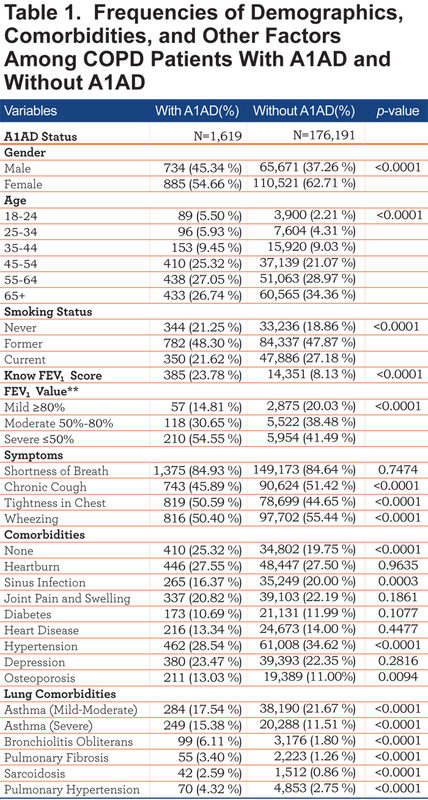 In addition, A1AD patients were younger and less likely to be current smokers (Table 1). Six percent to 10% of respondents were under the age of 35, where one would expect the prevalence of COPD to be extremely low. Exclusion of these participants from the analysis had no appreciable effect on the results (data not shown). Another interesting finding was that COPD patients reporting an A1AD diagnosis were more likely to know their lung function (Table 4 and Figure 1). This suggests that those with A1AD are more aware of their disease status and may be more educated about their disease than the general COPD population. Those with A1AD were also more likely to have a lower FEV1 value. The analysis of comorbidities found that AIAD patients reported several comorbidities with a higher frequency. For example, A1AD patients were more likely to report osteoporosis, which has also been demonstrated in other studies of A1AD populations.26 Patients with A1AD also reported more severe asthma, although this may, in part, be related to A1AD often being diagnosed with asthma for several years prior to the correct diagnosis of A1AD 3 and/or to the high prevalence of self-reported wheezing among patients with A1AD.24 When mild-moderate asthma was combined with severe asthma, both the groups with and without A1AD had a similar prevalence (32.9% versus 33.2%). The overlap between asthma and COPD has become the focus of recent work, including better case definitions for what comprises asthma in a patient with COPD.28,29 Of course, in this study, both the presence and severity of asthma was self-assessed and self-reported and not objectively validated. Interestingly, though, in this database, wheezing was less frequently reported in the A1AD population (Figure 2). Overall, A1AD patients reported less ability to work than other COPD patients. Both Campos et al and Stoller et al have reported similar findings in work absenteeism.16,30 This suggests more disability in A1AD patients. This is of particular concern in the A1AD population as they are younger and still of working age. Some of the most compelling findings in this study relate to the effect of A1AD on quality of life measures. Patients with A1AD were more likely to experience severe impairment to their work lives, home lives, and in their personal relationships. These data accord with the finding that 30% of participants in the National Heart Lung and Blood Institute (NHLBI) Registry of Individuals with Severe Deficiency of Alpha-1 Antitrypsin, whose mean age was 46 years, reported being medically unemployed.24 Patients with A1AD also had an increased risk of reporting more negative feelings associated with their disease. Alpha-1 antitrypsin deficiency individuals were more worried about how long they had left to live and grieved for who they used to be before they developed lung disease. Additionally, they were angry for burdening loved ones with their illness. This may reflect A1AD patients tending to have more severe lung disease at an earlier age and requiring more support from their loved ones. Also, given the genetic nature of the disease, they may be concerned about the health of their loved ones. This cross-sectional study may have several limitations. Given the nature of online surveys like the WebMD Lung Disease Health Check, it is difficult to know details about the source population from which the sample came. For example, we do not know the exact age (only an age within a range) nor do we know where respondents live. As this survey was available to people with access to the web and the WebMD site, it is impossible to know the survey response rate. For example, the results have very different implications if the respondent population consists of mostly patients with severe deficiency of alpha-1 antitrypsin or if respondents include PI MZ heterozygotes with milder deficiency. Notably, however, if the A1AD respondents in this survey represent an admixture of individuals with both severe and mild A1AD (e.g., PI MZ, which has been less associated with significant health consequences), then our findings further underscore the adverse consequences of having severe A1AD. This study has shown a variety of differences in A1AD and non-A1AD COPD patients. Of particular importance is the severity of quality of life impairment experienced by A1AD patients. It is important that health care providers be aware of and consider the fact that many A1AD patients have additional needs that may require attention. Such quality of life needs have infrequently been assessed in earlier A1AD studies. While this study has limitations, it is one of the largest population-based COPD studies. Also, the sample size for the subset of A1AD patients is one of the largest reported in the literature to date. Investigations into A1AD and COPD populations will provide better insight into one of the world’s leading causes of death today. This work was sponsored by the Alpha-1 Foundation and the COPD Foundation. DMM had full access to all of the data in the study and takes responsibility for the integrity of the data and the accuracy of the data analysis, including and especially any adverse effects. TM, DMM, EM, BMT, JWW, RAS, and JKS contributed substantially to the study design, data analysis and interpretation, and the writing of the manuscript. TM has no conflicts of interest. DMM has received research funding from GlaxoSmithKline, Novartis, Boehringer-Ingelheim, and Pfizer and has worked as a consultant or advisor for GlaxoSmithKline, Novartis, Boehringer-Ingelheim, Astra-Zeneca and Pfizer and is on the Board of Directors of the COPD Foundation and the Chair of the Medical and Scientific Advisory Committee for the Alpha-1 Foundation. EM is employed by the COPD Foundation. BMT has worked as an advisor or consultant for GlaxoSmithKline, Novartis, Boehringer-Ingelheim, Astra-Zeneca, Forest, and Intermune and is the Chairman of the Board of the COPD Foundation. JW is CEO of the COPD Foundation and the Alpha-1 Foundation. RAS has received research funding from Grifols, CSL Behring, AstraZeneca, and the NIH/NHLBI. He has served as an advisor or consultant for Grifols, CSL Behring, Baxter, AstraZeneca, and Alnylam. He is on the Board of Directors of AlphaNet and a member of the Medical and Scientific Advisory Committee of the COPD Foundation and is the medical director of the Alpha-1 Foundation and AlphaNet. JKS has served as a consultant or advisor for Boehringer-Ingelheim, Theravance, Grifols, CSL Behring, Pfizer, and Baxter, has received research funding from Astra Zeneca, and has served on the Board of Directors for the COPD Foundation, currently serves on the Board of Directors of the Alpha-1 Foundation, and is a member of the Medical and Scientific Advisory Committee of both organizations. 3. Clancy J, Nobes M. Chronic obstructive pulmonary disease: nature-nurture interactions. Br J Nurs. 2012; 21(13):772-781. 8. Kaplan A, Cosentino L. Alpha-1antitrypsin deficiency: forgotten etiology. Can Fam Physician. 2010(1); 56:19-24. 23. WebMD. 2014. Personal communication.